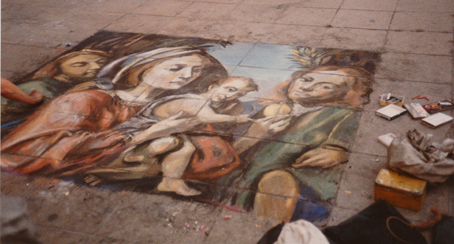 During University breaks, Jon found that pavement drawing was a good way to earn extra money and become more acquainted with some of his favourite painters. 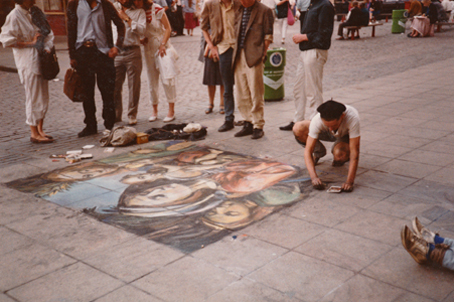 In this Photo taken on the 13th of July, Jon and girlfriend Caroline Le Breton are pavement drawing in Covent Garden. It is a Saturday and the first live aid concert is playing on an experimental screen in the Cafe behind them. Phil remembers sorting the coins into piles at the end of the day with Jon, Caroline and Jane and the total being over £200 – a lot of money in 1985!